Household mould health affects: Should you be concerned? How does household mould really affect your health? Image: iStock. By Jeroen Douwes, Massey University. Exposure to harmful agents inside the home can have profound effects on our health. After all, we spend an average of 16 hours a day at home – and even more when aged under seven and over 64. Mould accumulates in damp and poorly ventilated buildings. Inhaling mould fragments or spores can inflame the airways, causing nasal congestion, wheezing, chest tightness, coughing and throat irritation. Prolonged exposure to high levels of indoor dampness can reduce lung function and cause chronic health problems such as asthma. Those who already suffer from asthma and allergies are more likely to have more severe symptoms when exposed. According to the World Health Organization (WHO), a considerable proportion of the world’s 300 million cases of childhood asthma is attributable to exposure to indoor dampness and mould. People who live in damp and mouldy homes are also at increased risk of depression which, in turn, may increase the risk of respiratory symptoms and asthma. The most infamous type of mould is “black mould” (Stachybotrys chartarum), which can grow on water-damaged building materials and produce toxic spores. In 1994, it was linked to a serious respiratory illness after ten children experienced idiopathic pulmonary haemosiderosis (bleeding from the lung) and one subsequently died. It’s commonly assumed that mould causes the health problems described above, though the evidence for this is generally weaker than for dampness itself. This may be related to the fact that scientists are still struggling to accurately measure indoor mould exposures. 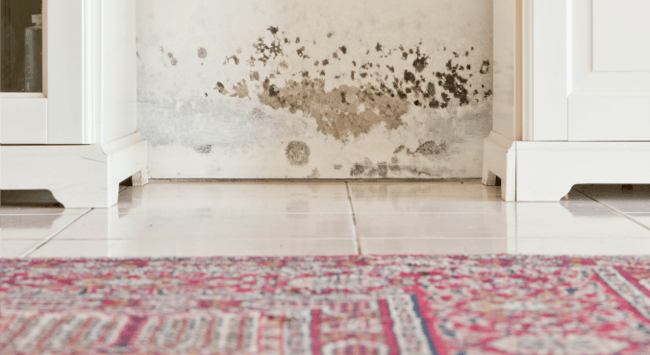 Indoor dampness and mould may not only aggravate pre-existing respiratory conditions, there is also (limited) evidence it may cause new symptoms. The WHO estimates that in cold climates, 15% of dwellings have signs of dampness and 5% have signs of mould problems. In warm climates, the estimates are 20% for dampness and 25% for mould. Since dampness is more likely to occur in houses that are overcrowded and lack appropriate heating, ventilation and insulation, the prevalence of damp indoor problems in low-income communities and rental accommodation can be substantially higher. Climate change and its effects on the weather (storms, heavy rainfall and floods) are likely to further increase the proportion of buildings with damp problems. It’s also critical to avoid water leaks by controlling and maintaining rain and surface water drainage. Where holes are created in the roof or walls to allow skylights, windows, doors, pipes or other structures to be fitted, make sure these are watertight. If you find visible mould in your home, remove the mould and identify and address the cause of the excess moisture. Clean hard surfaces using soap and water or, if mould growth is persistent, a bleach solution could be used. You may need to throw away absorbent materials such as carpets, depending on the level of contamination. In case of extensive mould damage, you may need to call on commercial mould remediation services. Although those with pre-existing allergies or asthma are at greater risks, mould can also cause health effects in otherwise healthy people. So measures to prevent or reduce mould exposure are important to everyone. Some regions may require stricter regulations and building codes to prevent dampness and mould. Damp problems are particularly prevalent in rental houses, often due to poor maintenance. So regulators should also consider a periodic inspection system (or “warrant of fitness”) to ensure minimal housing standards are met.